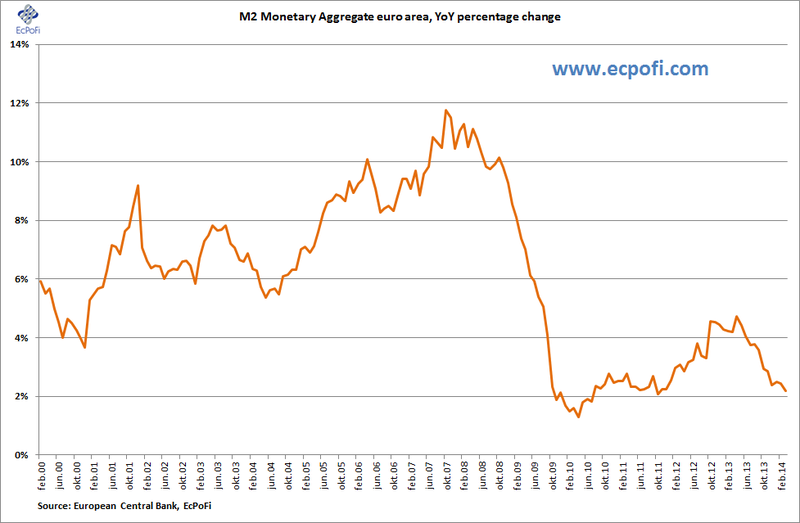 The year on year (YoY) growth rate for the M2 money supply fell to the lowest level since October 2011. The YoY growth rate for the M3 has now hovered around the 1% benchmark since October last year. The last time the growth rate was this low was during the October 2009 to June 2011 period. 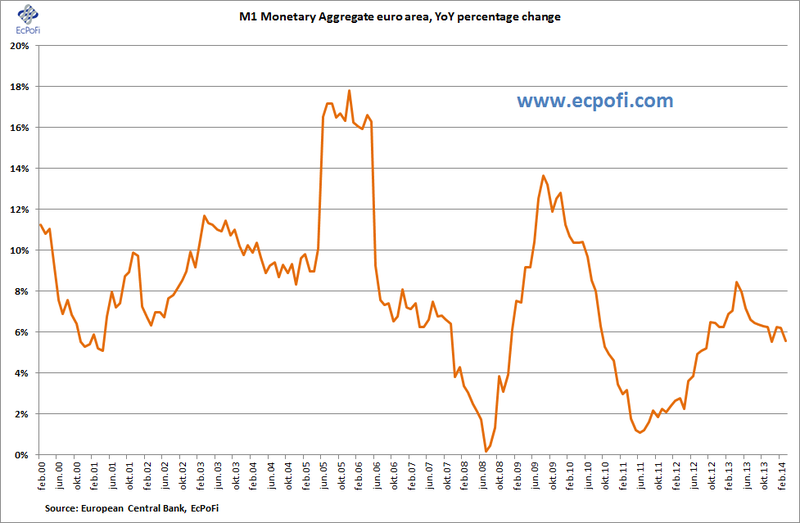 The M1 money supply is still growing significantly, but at 5.6% on last year it is down significantly since hitting 8.5% in April last year. While the growth rates in money supply continue to slow down, the monetary base continues to contracts and is now the lowest it's been since July 2011. 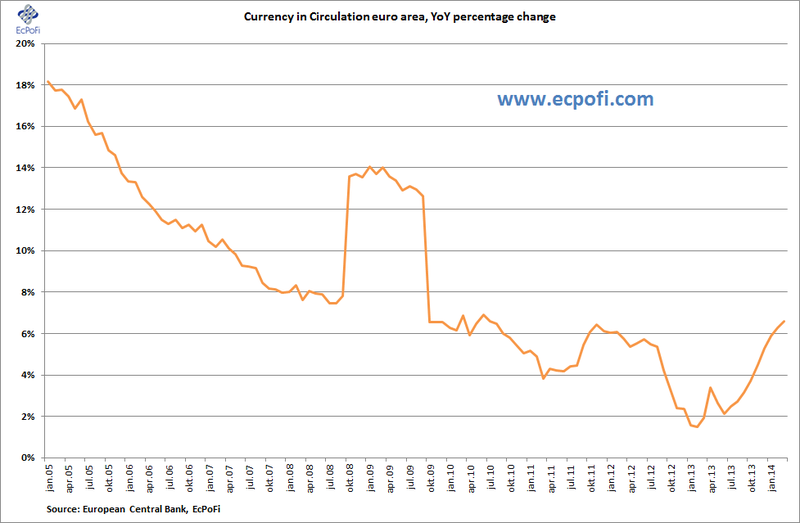 But here's the really interesting thing: Currency in circulation (i.e. banknotes and coins) is growing at the fastest pace for almost four years. 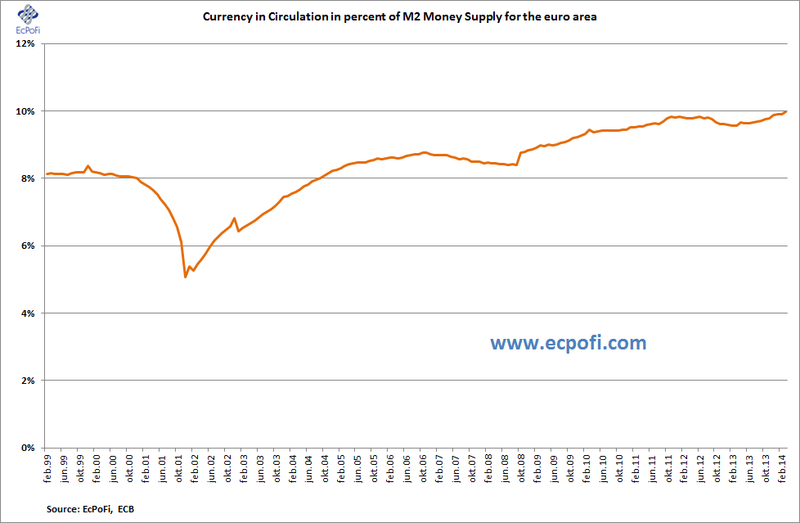 Furthermore, it now makes up 10.0% of M2 money supply, the highest share ever reported since the introduction of the euro. This is a fairly clear indication that the demand for holding cash, as opposed to depositing them in banks, is increasing. The reasons for this could be many, perhaps a lack of trust in banks following the banking crisis culminating in 2008 or an expanding black market (or worst case, the early stages of a classic bank run). Whatever the reason, it is noteworthy this is happening even as banking has become more electronic than ever before and the practical reasons for holding cash are arguably the lowest they've ever been in the history of money and banking. This trend is bad news for euro zone banks (and inflationist policymakers) as the public's increased holding of cash means banks have less money (deposits) available to lend out and a lower reserve ratio to support lending as a result. 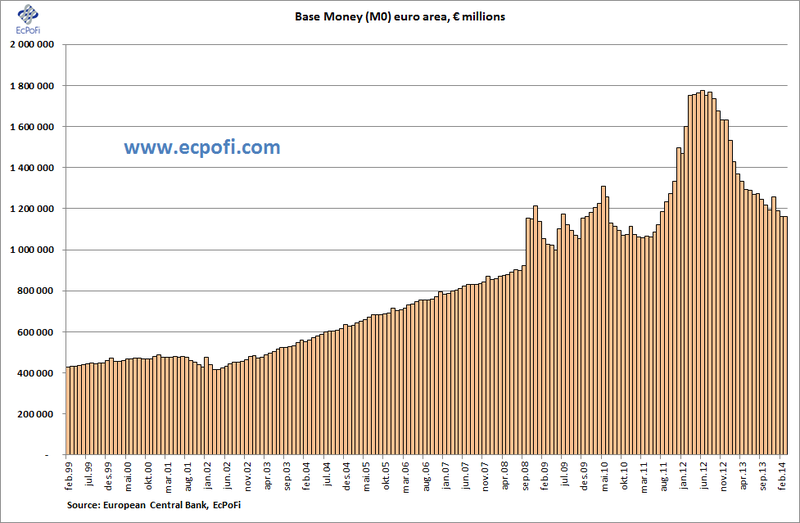 Do not be surprised if the war on cash is stepped up a gear or two in the euro zone going forward. The increase in the demand for holding cash by the public could be a factor contributing to the plummeting of lending by euro area banks during the last two years or so. 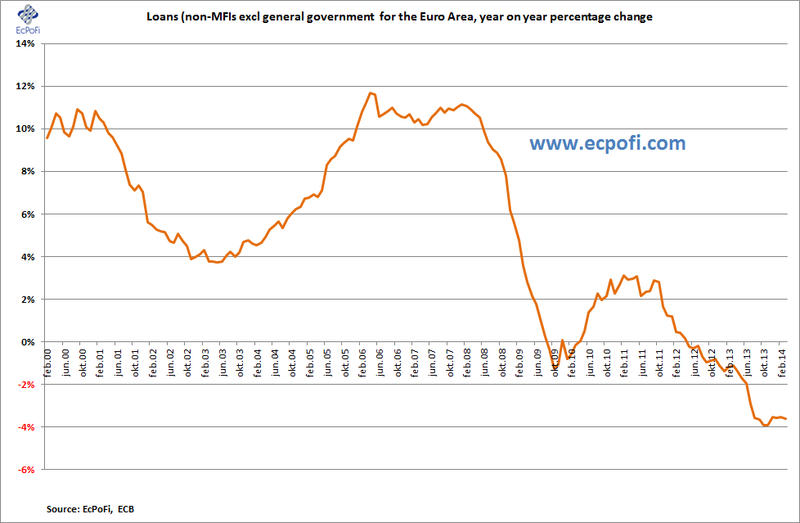 Loans to the public (which excludes governments) fell by 3.6% in March compared to the same month last year. This was the 23rd month in a row with negative growth on last year which again helps explain the relatively low growth in the money supply measures (as a net increase in bank lending increases the money supply). The above dismal charts, from an inflationist view point that is, helps explains why Draghi and the IMF are so desperate to once again expand the ECB balance sheet (deflation paranoia), but can't due to legal constraints (e.g. here). As the creation of new money does not create wealth, but instead causes misallocations of resources in the economy as, ironically, the central banker of all central bankers understands, the above decline in the money supply growth rates is a development to be welcomed. 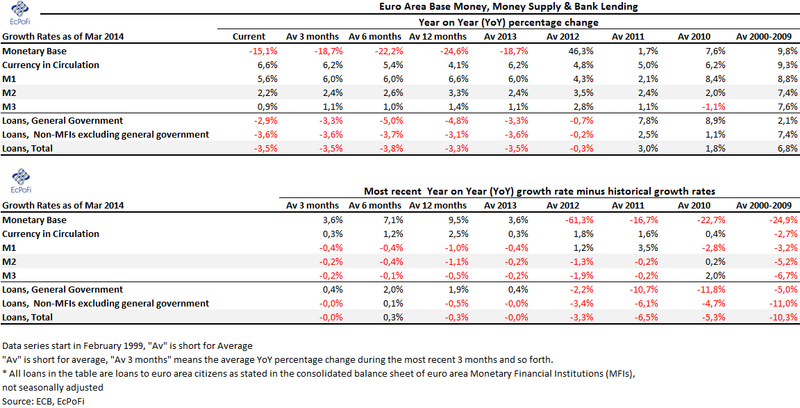 A declining growth rate will reveal these misallocations and could lead to a decline in prices measured in euros. But this is just a natural adjustment which would have to take place sooner or later anyway. As a result, this would also (re-)expose previous malinvestments not yet properly dealt with, such as overvalued assets on bank balance sheets. But this is again ultimately inevitable, and further monetary inflation would just postpone the necessary adjustment. The damage was done through aggressive lending growth and monetary expansion in the years preceding the bust in 2008 (see the charts above) - this damage cannot be rectified through doing this all over again, it cannot be cured by doing more of what caused it in the first place. Nor can it be rectified through shrinking the money supply. But it can be rectified through ending monetary expansion, i.e. ending the fractional reserve banking system supported by central banks which are able to create money out of thin air (even Martin Wolf at the FT is starting to understand the damage done to the public by banks creating new money). Finally, an end to monetary inflation needs to be combined with pro free market policies and an end to government deficit spending for the euro area to once again prosper. 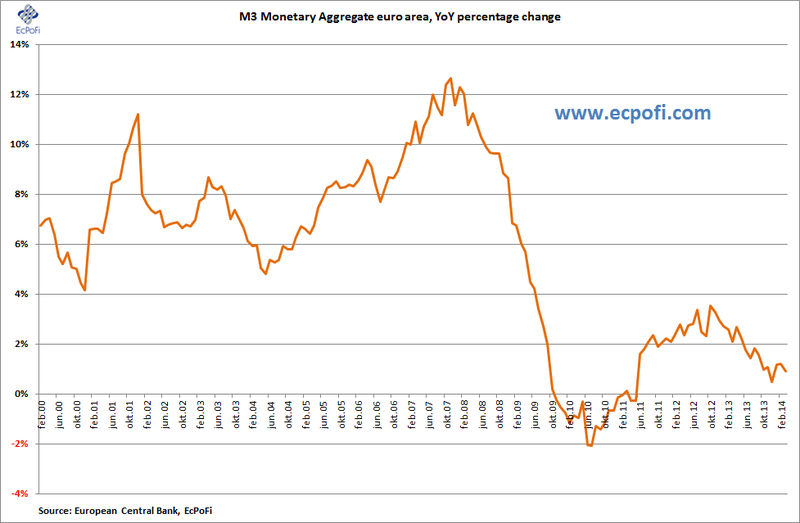 The euro area is nowhere near achieving this at the moment especially with respect to free market policies and government spending, but also with respect to monetary inflation - narrow money (M1) is still growing significantly though the growth rate is declining. But the ECB, the European Commission, the EU and the various euro area governments are instead focusing on more regulation and more integration which will only make matters worse, expand bureaucracy even further and drain ever more resources from already drained economies (also see this article).